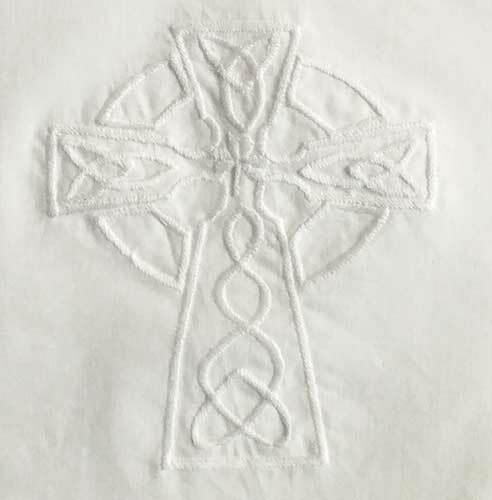 Irish Baby Christening Gifts feature shamrocks along with Celtic icons; these future heirlooms are brilliant way to celebrate baptism day. 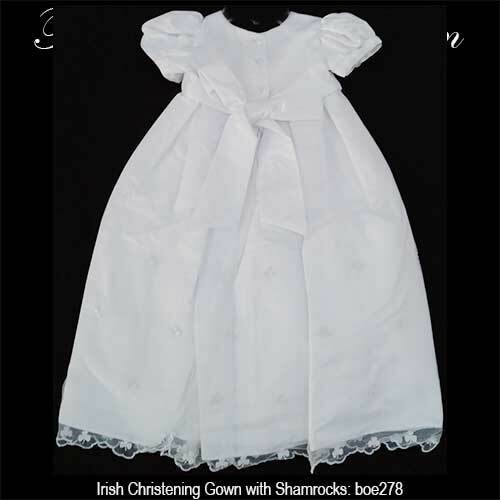 Our collection of Irish Baptism Gifts includes Christening gowns with shamrocks along with a Baptismal suit for an Irish baby boy. 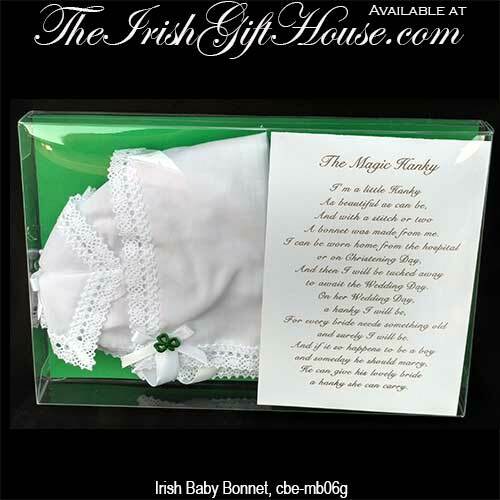 The Irish Gift House also features a selection of Irish baby bonnets that includes the magic baby bonnet with shamrocks that later transforms into a wedding hankie. 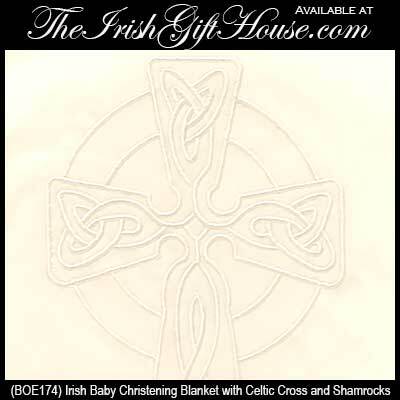 Naturally, we also offer shamrock baby shoes along with Irish Christening blankets with the Celtic cross icon. 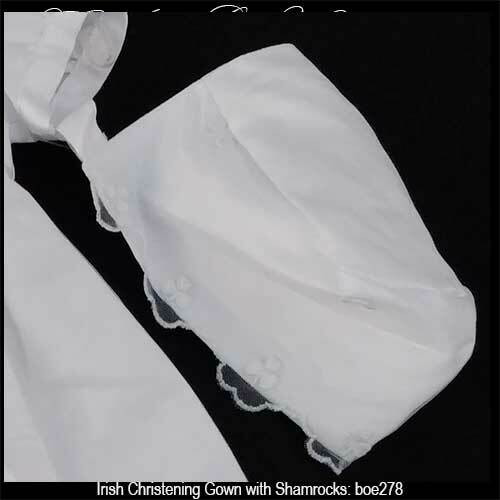 Boy's Irish Christening outfit features white shamrocks on the vest and tie. 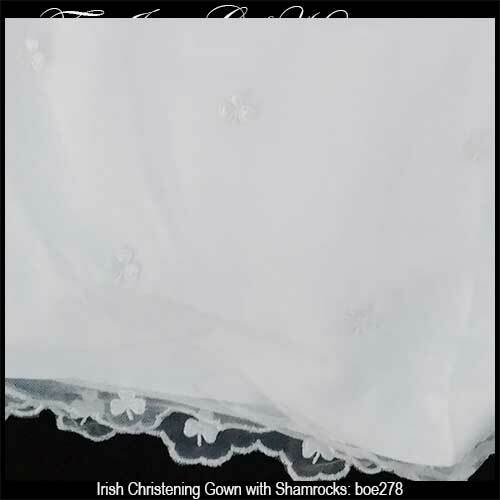 Irish Christening gown features an embroidered Celtic cross and shamrock motif that is repeated on the bonnet and bib along with shamrocks on the booties. 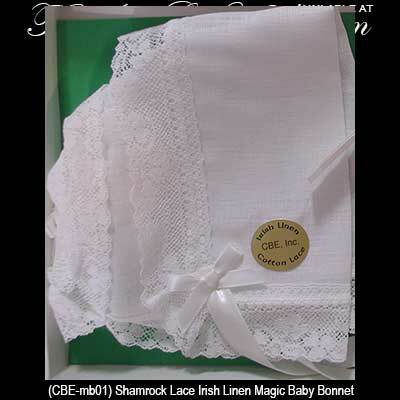 Irish baby bonnet with green shamrocks is known as the magic baby bonnet; it is ideal for baptism and latter baby's wedding. 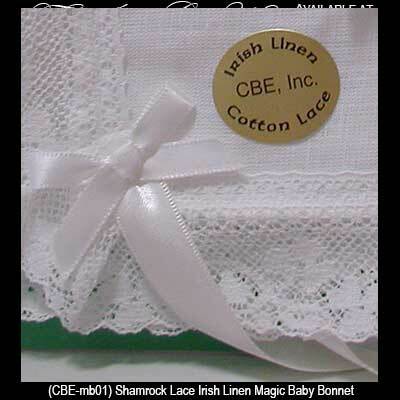 Irish baby bonnet with white shamrocks is known as the magic baby bonnet; it is ideal for baptism and latter baby's wedding. 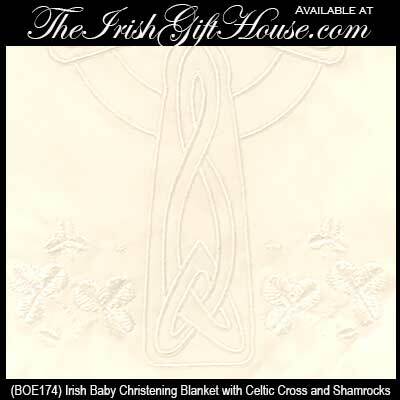 Irish baby onesie features a white on white Celtic cross; the outfit would be ideal for an Irish Christening. 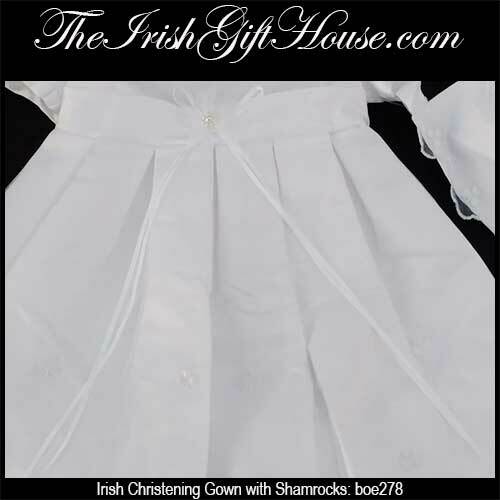 Irish baby shoes for a boy feature white shamrocks; they are ideal for an Irish christening. Irish baby shoes for a boy feature green shamrocks; they are ideal for an Irish christening. 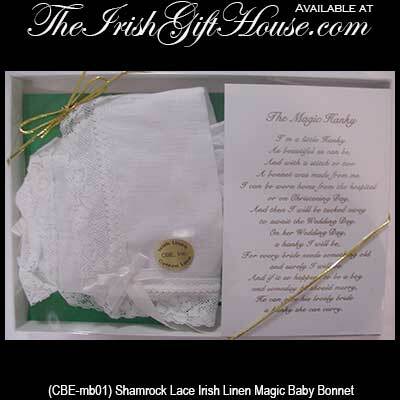 Irish baby shoes for a baby boy feature white shamrocks; they are ideal for an Irish Christening. 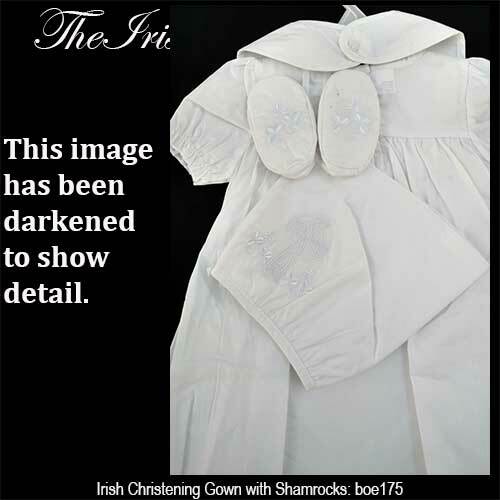 Irish baby shoes for a baby girl feature white shamrocks; they are ideal for an Irish Christening. Irish occasion card features a blessing for baby’s christening. 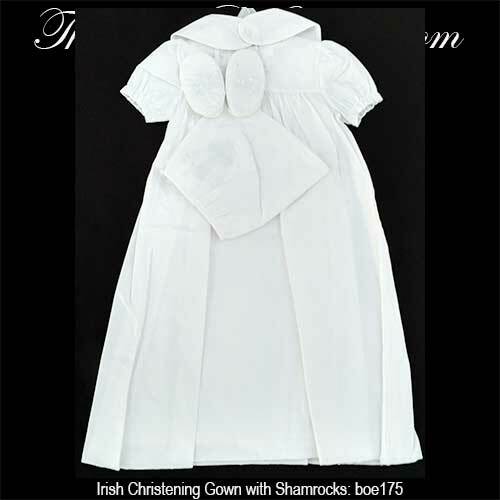 This baptism dress is an Irish Christening gown with shamrocks that includes a slip and bib along with a bonnet and booties. Sorry, this gown is now sold out. 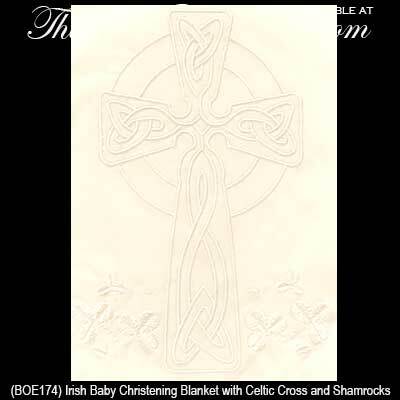 Irish bible for baby or child features a cross with a shamrock in the center. Sorry, this Irish baby Bible is now sold out. 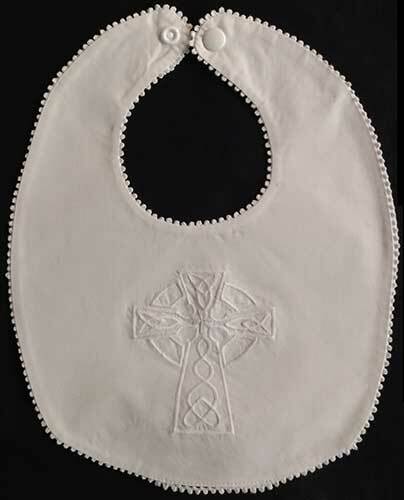 Irish Christening bib for a baby boy features a white on white Celtic cross. 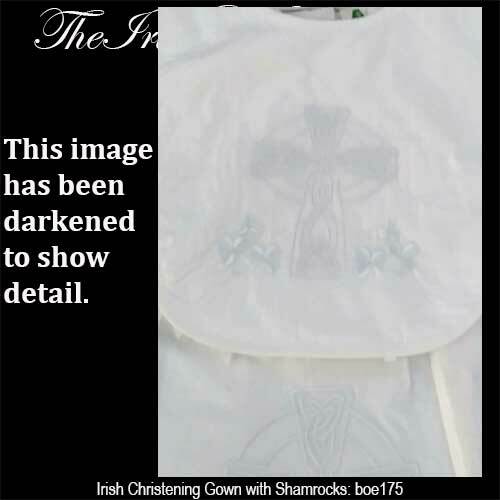 Sorry, this Irish baby Christening bib is now sold out. 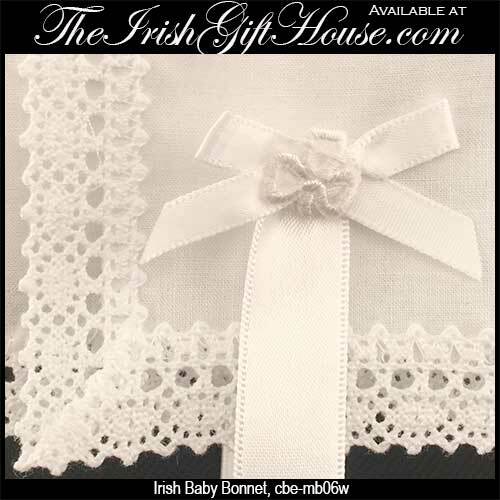 Our Irish baby gift section offers additional ideas for your child's baptism; your may wish to browse our assortment of Irish baby blankets along with our Irish baby picture frames. Many of the selections located in our Irish baby keepsakes category are destined to be handed down through future generations. Please take a look at our Celtic wall crosses and our standing Celtic crosses for additional Irish Baptism gift ideas. 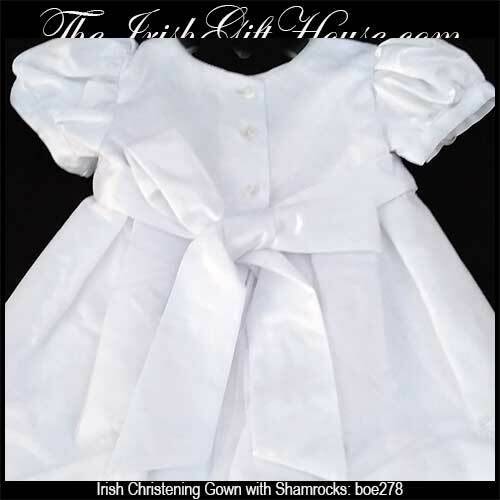 The Irish Gift House also features a grand selection of Irish baby jewelry that is sure to become treasured keep sakes.